Shot beautifully in black and white, Israeli artist and filmmaker Avishai Sivan's Tikkun tells a story about a young orthodox Jewish man, embodied astonishingly here by first time actor Aharon Traitel, slowly losing his faith after a near-death experience. With impressionistic visuals, Sivan paints nighttime Jerusalem as a Lynch-ian netherworld, shrouded in fog, where past and present exist side by side. The result is a hallucinatory tale of urban alienation, invoking the films of Antonioni. Haim-Aaron (Traitel) is a devout Yeshiva student, seen praying and fasting in the begining. He is not a talkative type and keeps things to himself. His father (Kalifa Natour) is a hard working kosher butcher. Bad plumbing in their cramped apartment causes Haim-Aaron to fall and suffer cardiac arrest while taking a shower and touching himself. EMTs arrive but are unable to resuscitate him, pronouncing him dead after 40 minutes. Haim-Aaron's father, unable to let his first son go, continues on the CPR, and to everyone's surprise, revives him. This near-death experience is a both a blessing and a curse for father and son. Father struggles with the guilt of undoing god's will by reviving his son. He falls into deep self-doubt and is shunned by many of his ultra orthodox community members. For Haim-Aaron, being undead affords him a freedom to venture out of his community and confront his hidden earthly desires for the first time in his life. Unable to sleep, Haim-Aaron wanders the streets at night, hitching rides to anywhere these nocturnal strangers will take him. For him, outside his immediate surroundings is a completely different world: Jerusalem, a cosmopolitan city with just under a million inhabitants, is a wondrous and scary place for him. He meets many strange people and even gets to have a sexual encounter with a street worker. These activities put a strain on his studies, family and community. Tikkun is, in many ways, an unsettling film. The uneasy tone is accentuated by Haim-Aaron's father's recurring horrific nightmares: evil crocodiles in the toilet, putting a knife to the back of his son and dumping the body in a monster-infested ravine. Like Sivan’s previous feature The Wanderer, the urban alienation and repressed sexuality figure prominently into Tikkun. The film unveils the ultra-orthodox Jewish community, which is seldom portrayed in film, and perhaps somewhat unflatteringly here: with rigid traditions and rules, the community seems to be permanently stuck in the past. In the hands of Sivan and his cinematographer Shai Goldman (The Band's Visit, The Kindergarten Teacher), Jerusalem has a look and feel of the lonely, unnamed industrial town in Eraserhead. 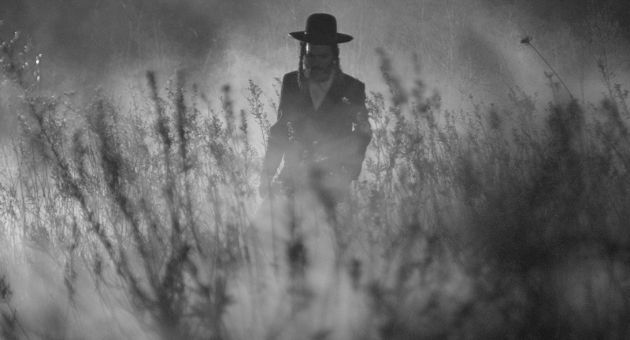 With sparse dialog and strong visuals, Tikkun is intense, moody filmmaking and signals Sivan as one to watch for in the world of arthouse cinema. Tikkun screened earlier this year at New Directors New Films series. It opens in New York on Friday, June 10, via Kino Lorber.